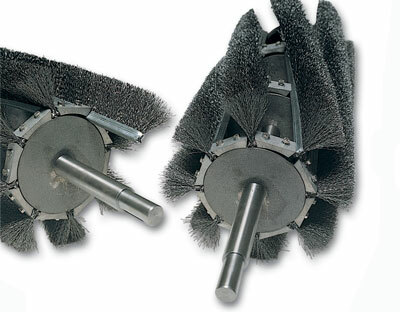 “Master” Rollers are cylindrical brushes with helical sections having peculiar technical characteristics where the brushing element is the “strip”. The linear brushes are mounted on a rotating metallic shaft. The way it is built allows for continuous brushing with the disposal of waste material. 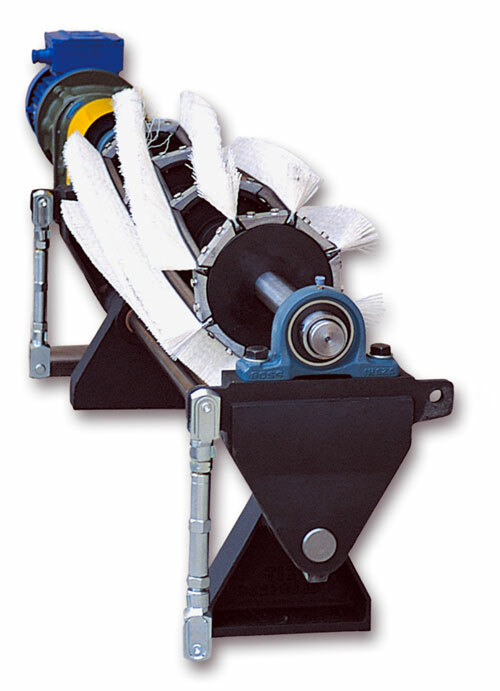 The Brush consists of a steel shaft mounting turned discs, on which the “strip” are applied using screw-in wedges (RMA = Roller Master Open) or it consists of an iron tube mounted on the shaft, that bears strip welded sheathings (RMC = Roller Master Closed). The helical positioning of the elements keeps a part of the brush always in contact with the surface to clean acting continuously and without skipping. This also favors the lateral shifting of the water material removed. 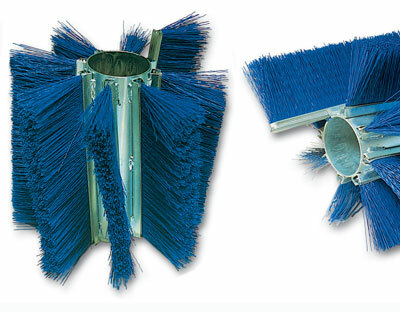 The distance between the elements or sectors of the brush allows the total discharge of the material and avoids the risk of obstruction of the brush: the resulting brushing action is more effective and high performing. There are 2 types of Master Rollers: Open Master Rollers, classified in Light (RMAL) or Heavy (RMAP), and the Closed Master Rollers (RMC), different for type of application of the linear Strip brush and the ease of mounting/demounting and maintenance (the heavy open roller master are the ones easier to replace and maintain, while the closed roller master are those that require a more complicated operation to replace the strip). The strip brushes are detachable and interchangeable with the maximum ease. In all the “Master” Rollers the operation of replacement is very simple and can be performed without disassembling the shaft! In the open Master Roller it is sufficient to loosen the screws that retain the dove tail inlay and pull out the brushes from the side or radially depending on the ability to reach it. In the closed Master Roller to replace the strips it is sufficient to pull them out laterally from the sheaths. When the “MASTER” roller cylindrical strip brush is closed, it will be sufficient to pull the strip brushes out sideways. According to the final purpose of the application, by the type of surface to be cleaned and the type of material to be carried out, the “MASTER” will properly respond to the end user’s needs and requirements. Choosing the filament to mount is strictly dependent on the material to be cleaned: the filaments can be synthetic, metallic, vegetable and mixed. Choosing the type of Roller Master is depending on the type of application (type of surface to clean, type and quantity of material to remove, and more...). For support in case of doubts, our Technical Office can help you.